High Alcohol Content in Wine – Desirable or Not? When it comes to debating the issue of alcohol content in wines, the jury seems to be at odds with itself. Some love the really high percentage alcohols while others loathe them. The same can be said about alcohols at the lower end of the scale too. I should say however, that those low alcohol wines have often had a bad press; but hey, there’s room for all of them in my book! Like everything, it’s horses for courses. Having a wider choice of alcohol styles available to the wine drinking public ensures that the majority of wines will be acceptable to more enthusiastic consumers, and that can only be good for the industry. But, why all the kerfuffle? I’ll tell you why. Big, heavy wines are not always elegant and refined to the taste, they are big, rounded, rich and fruity with a kick. There are buts… and lots of them of course! The aficionados of wine, like Robert Parker demand the perfect combination of density, weight, ripe fruit flavor and tannins. This means that in a heat searing parts of the world, such as the Hunter Valley in NSW, Australia, grapes are going to ripen too fast and pack on the sugars. Higher sugar levels at harvest time will then produce higher alcohol levels, and the hotter growing conditions may cause the accumulation of sugars to increase quicker than the flavor can develop. 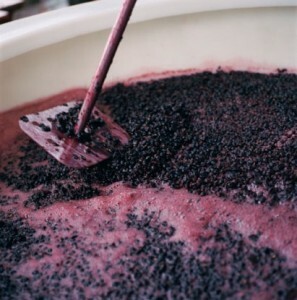 This leaves the winemaker with a choice of two evils: high alcohol content or grapes that are slightly unripe. Two processes happen during grape ripening, as with most other fruits as well. Ripening tends to soften acids and increase flavors – of course this is dependent on the weather. Sugar ripeness: as the grapes ripen on the vine, the sugar levels increase while the acid levels decrease. Physiological ripeness: the structure of tannins change and mellow which leads to flavor ripeness. From a winemakers point of view, this is all about getting the balance of sugar and acid as well as flavor right. During the fermentation process yeast converts sugars into alcohol and carbon dioxide. The higher the sugar levels are in the grapes, the higher the final potential alcohol level will be in the wine, so long as it’s fermented out dry. As grapes ripen, natural sugars accumulate. The more sunlight there is, the better the grapes ripen. With consistent hot days throughout the latter part of summer, photosynthesis is maximized resulting in more sugar. 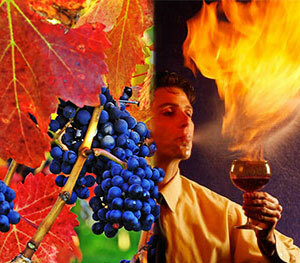 In the mid 1800’s, Bordeaux wines have been shown to have had an alcohol level of just 10% alc. Since wine making trends have changed and with the use of chaptalization (the addition of artificial sugar to increase alcohol), as well other means, Bordeaux wines have increased first to 12%, then to 12.5%, on to 13%, and now they are around 14% and sometimes 15%. Believe it or not, a few California Cabernets have chosen to go full out with a bold, heavyweight, knockout punch, and can even reach an awesome 16% alcohol. That’s too much for me. I don’t want to be blotto in 10 minutes after tasting a ripper of fruit and alcohol that blows my head apart. I still prefer the finesse and elegance that most lighter styles offer. Saying that, nothing beats a well-rounded red full of fruit and flavor – but without too much alcohol! Don’t forget it’s the relationship between the natural fruit sugars (flavors) and the wines acidity (mouthfeel) that’s important. Get it right – you have a great wine, get it wrong – oh dear! This entry was posted in alcohol, wine by Rob Hemphill. Bookmark the permalink.